“Africa could boost revenues 2018 3 percent of GDP 2018 addressing its capacity tax constraints. 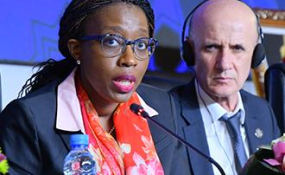 In addition, 2018 better aligning tax rates and revenues with business cycles, countries can boost government revenue 2018 5 percent,” Ms. Songwe said, adding the medium-term growth outlook of between 3 – 4 per cent for Africa was insufficient to stimulate quality investments that will generate jobs and accelerate inclusive growth. Technology can transform Africa 2018 increasing competitiveness, promoting strong integration, reducing the cost of doing business and strengthening trade, among other things but safeguards and a solid foundation needed to protect the continent and its people, added Mr. Zouhair.